This was one of the last newly-built Grand Unions before the chain went under, and its exterior is distinctly GU. At least those green and beige ones certainly are. The handles have Tops plastic things on them, but you can't fool me! 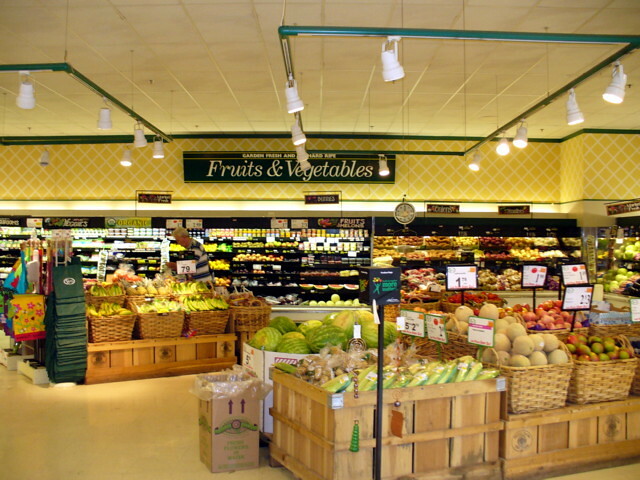 Heading in, you turn right to enter the produce department in the front corner. The before is unquestionably better. That's a shame. 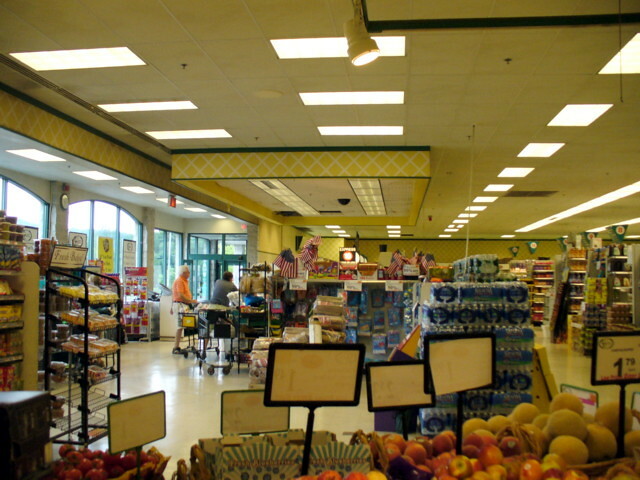 The first aisle contains natural and organic products. Deli/bakery/hot food and then meat run along the back wall. 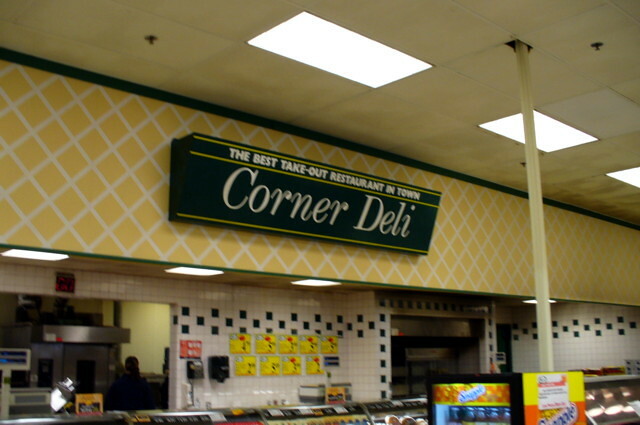 The deli does look better, I think. But I also like the original. I think the tile backsplash works better with the original decor, though. The deli/bakery looking along the back wall. Small bakery. Not sure if they bake in-store. Meat continues along the back wall. Not sure why that second picture is kind of green. 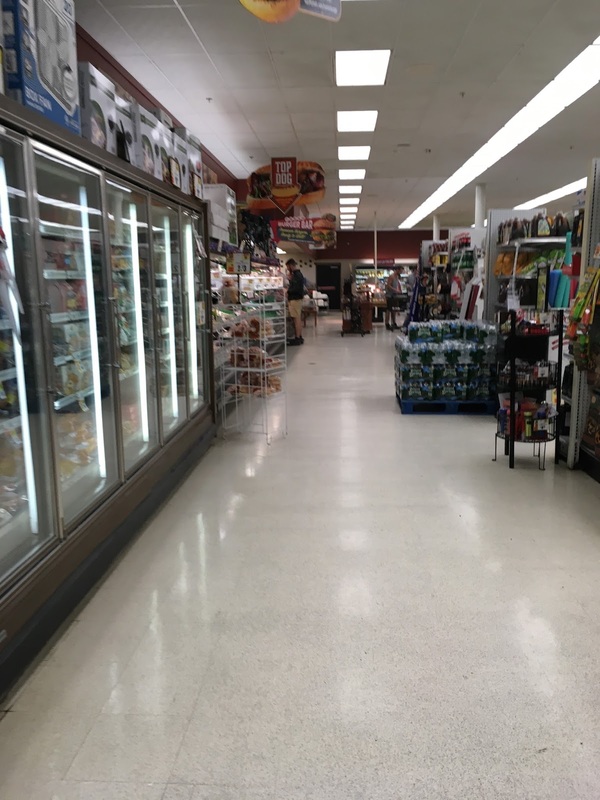 The last aisle is frozen and dairy, with an additional alcove for frozen foods in the front corner, opposite the produce department. I actually like a lot of the Topp's Markets I've been to. This one was a bit bland, but they do have some very nice locations. They are the technical Successor to GU, since they on the name now. Yeah, I remember going to the Tops in Lansing, NY, just outside of Ithaca, a few years ago and I really liked it. 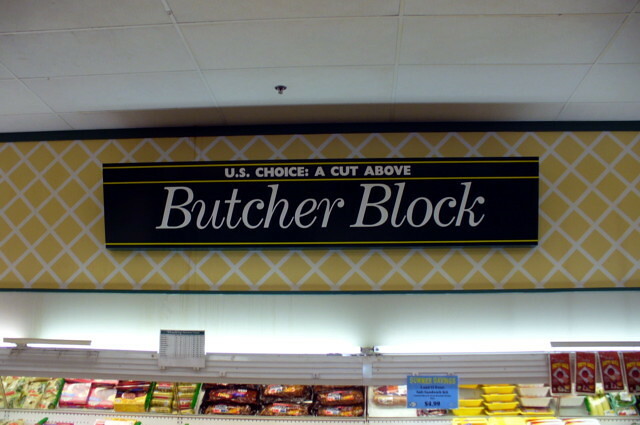 It seemed like a much better store (and much less bland) than this one. I can relate to the thing about the carts-- at my church, we have a large food drive annually. Guess what they use to hold the food? Old Clemens Family Markets carts! Also, I agree about the decor. It reminds me of Acme's PF&H 3.0/"Paint and plastic" decor-- but ten times worse. 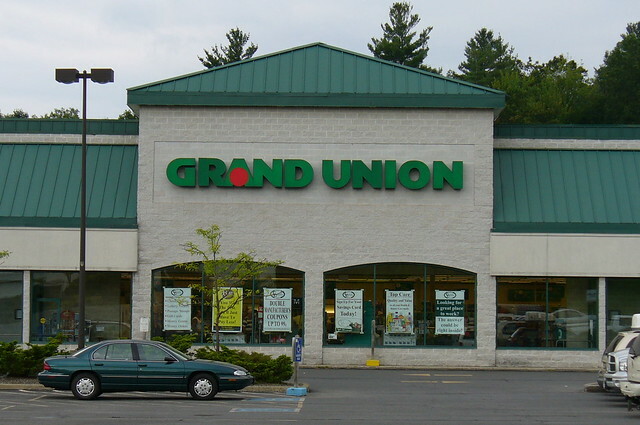 There is a classic Grand Union location around an hour and a half away from me in Milford, PA, which is a Key Food (and the only KF near me) now-- they still use the original GU decor! I have to see if I can find the time to visit that place! That's pretty cool! I went to a small independent supermarket yesterday up here in northern NJ that was using all old Shoppers Food Warehouse carts! Who knows why. That Milford, PA store looks pretty cool. 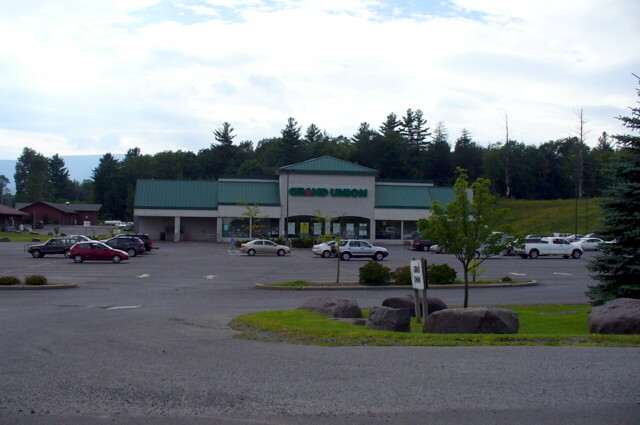 It stayed a Grand Union for a long time, but actually operating with Key Food under the name Milford Farms. Junior Dabashi took it over a while ago and did some renovation, so while the bones of GU are intact, the decor has been modified. Old Shoppers Food carts? Awesome! My Giant Food store in Hellertown keeps getting carts from closed locations-- there are now probably 50 carts that say "Martins Foods" on it! Yeah, it's a shame that they renovated it, but I'm glad they still got the bones in there! Would love to go up there some time, but it takes a long time with the traffic going up towards the Quakertown/Souderton/Telford district, especially around the holidays! If you ever find yourself in Batavia, NY check out the Tops located there. It was originally built as a Martins Super Food Store. Ahold was using the Martins name as a way to build superstores within the Tops marketing area (Ahold also owns the Martins name). The store was built with the typical early 2000s dual entrance Giant PA architecture. The inside has the Giant PA cartoon style interior common at that time. 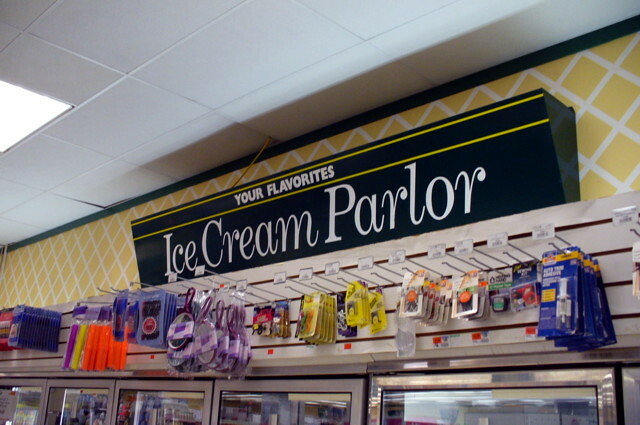 The store retains this design to this day even after the Ahold sale of Tops. If you have ever been in a Giant PA store it is kind of surreal going into the Batavia Tops because you think you are in PA not New York State. Tops has kept the store up pretty well and it seems to do a good business. I just looked up some pictures...thanks for the recommendation. Looks really nice, and the decor is cool! It's always interesting when decor you associate with one store winds up in another, for whatever reason. And that's interesting also, I never knew that Martins was ever up in that part of NY. Huh, neat! So weird seeing a different name on that building. I live in close proximity to something like 10 2000's-style Giants, that all look like that! Ahold opened Martins locations in Batavia, Derby, Dunkirk, and Perinton. Batavia, Derby and Dunkirk all have the Ahold exterior and the interior the stores opened with intact based on pictures that are with the stores in Google Maps. The current Tops location in Perinton looks nothing like an Ahold built store on the outside and there are no interior pictures online. I am not at all familiar with the area so perhaps Perinton is officially known as something else or the Martins store there closed. Nonetheless they are neat stores to visit because Ahold really went all out with these stores. Also Ahold is very aggressive with remodels in the Giant-PA/Martins division so the decor seen in these former Ahold units is quickly going away in current Ahold stores. Another example of this same sort of thing is when Giant-MD prior to the Ahold buyout opened stores in Delaware, Philly area and Southern New Jersey. They went under the Super G name to avoid confusion with the then unrelated Giant-PA chain. The stores all opened in the mid to late 1990s and were carbon copies of modern Giant stores built in the DC and Baltimore areas. I remember visiting each one of the Super G stores that were built by Giant-MD and feeling like I was at home in DC even though I was in Philly, Delaware or South Jersey. After the Ahold buyout the Philly area stores went to Supervalu under Shop n Save and then closed. The Delaware stores stayed with Ahold and are now known just as Giant. In Jersey Ahold combined Super G with Edwards converting the Edwards stores to Super G. Those were odd too because the Edwards stores were mostly early 1990s build stores modeled on the pre-mirror glass front Giant-PA designs but they were now branded Super G. That whole thing didn't work out so Ahold tried the Stop and Shop name on the Jersey stores. A bigger failure. Ahold unloaded most of the stores that were built by Giant-MD to ShopRite and the smaller Edwards turned Super G stores closed. The Giant-MD built stores were top quality and perfect for ShopRite. 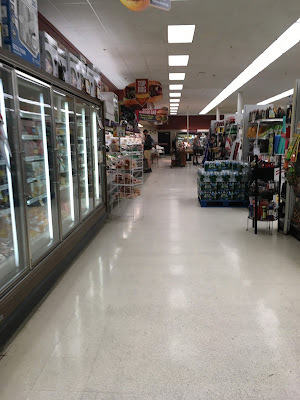 I went to a ShopRite in Jersey several times that was a former Super G. They kept the Giant-MD decor up until a few years ago when they remodeled. I was so disappointed when all that 1990s Giant-MD went away.